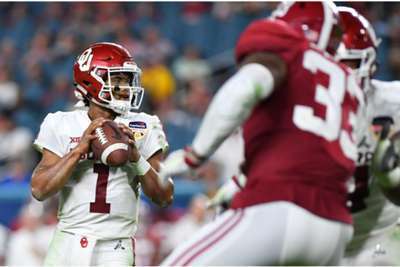 Despite being the favourite to be the first pick in next month's NFL Draft, Kyler Murray has come in for plenty of recent criticism, which has been labelled as "garbage" by his former Oklahoma team-mate Ben Powers. Diminutive quarterback Murray, a two-sport star at Oklahoma who chose to pursue football over a career with MLB's the Oakland Athletics – who drafted him ninth overall last year, is now seen by many as a lock to be taken number one overall by the Arizona Cardinals. NFL Network's Charley Casserly claimed he received feedback from Murray's interviews at the Combine that he described as "the worst report I've ever heard on a top-ranked quarterback", criticising Murray's leadership, study habits and ability to draw up plays on a white board. Casserly was swiftly rebuked by Murray's agent Erik Burkhardt while Oklahoma head coach Lincoln Riley also came out in defence of his quarterback. The debate over whether Murray made the right move in quitting baseball has come back into focus in the wake of Mike Trout's reported $430million extension with the Los Angeles Angels.